Want a SOUNDBAR? Get a MEGA DEAL! 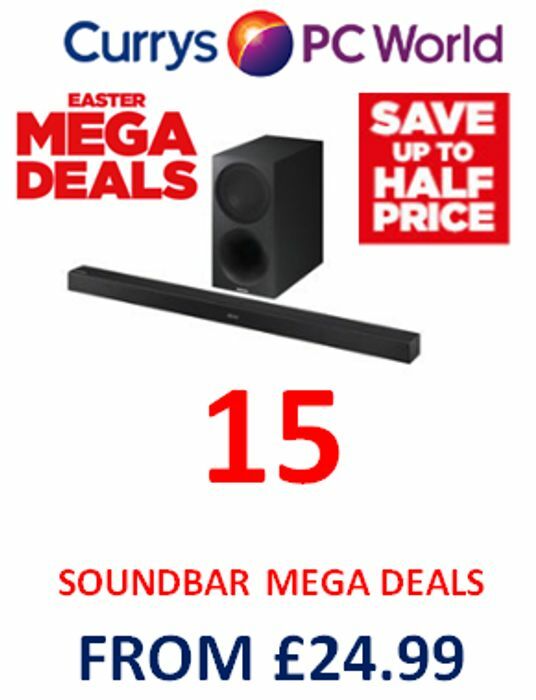 If you're looking to buy a sound bar, Currys Mega Deals are a good place to start! There's 15 soundbar Mega Deals right now, some even better than half price. The LOGIK L32SBT17 2.0 Sound Bar for example is reduced from £69.99 to just £24.99 - save £45! Free Delivery too at Currys. Want to be sure you’re getting unbeatable value? At Currys PC World, we promise to match or beat the price you’d pay at AO.com, Argos, Asda, John Lewis or Tesco. Even if our competitor’s running a voucher-offer discount, and even up to 7 days after you’ve bought from us. Johnny Another spammer Johnny - why do these people actually go to the bother of creating an account then rubbishing a good deal! I am into my hifi and although I would never buy a soundbar thats a great deal for those people who would buy on for their telly I havent even seen one as cheap as that even in Home Bargains or B&M. garygemmell One has to wonder!